"The best way to understand the dramatic transformation of unknown books into bestsellers, or the rise of teenage smoking, or the phenomena of word of mouth or any number of the other mysterious changes that mark everyday life," writes Malcolm Gladwell, "is to think of them as epidemics. Ideas and products and messages and behaviours spread just like viruses do." 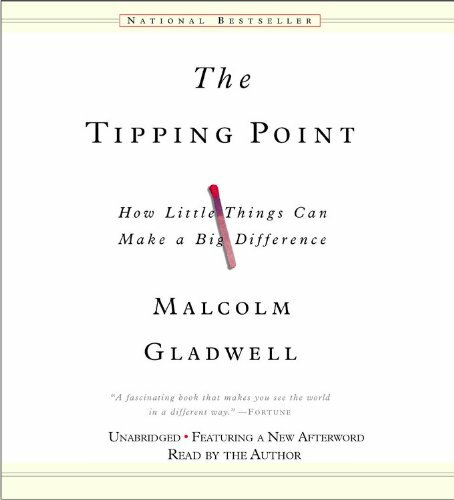 Although anyone familiar with the theory of mimetics will recognise this concept, Gladwell's The Tipping Point has quite a few interesting twists on the subject. For example, Paul Revere was able to galvanise the forces of resistance so effectively in part because he was what Gladwell calls a "Connector": he knew just about everybody, particularly the revolutionary leaders in each of the towns that he rode through. But Revere "wasn't just the man with the biggest Rolodex in colonial Boston", he was also a "Maven" who gathered extensive information about the British. He knew what was going on and he knew exactly whom to tell. The phenomenon continues to this day--think of how often you've received information in an e-mail message that had been forwarded at least half a dozen times before reaching you.